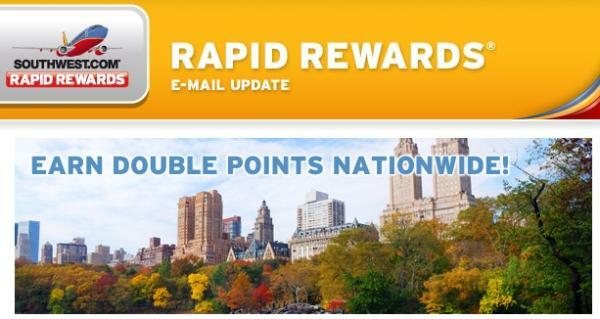 Southwest Airlines has now launched a public offer for double Rapid Rewards points nationwide. Southwest Airlines had a false start and had targeted offers last month that were promptly withdrawn. This offer is valid for flights booked and flown between October 14 and November 21, 2013. You need to register for this offer in order to earn the bonus points and you can do it here. You can now earn 24 points on Business Select (12 base + 12 bonus), 20 points on Anytime Fares (10 base + 10 bonus), and 12 points on Wanna Getaway fares (6 base + 6 bonus). You can access this offer by logging to your Rapid Rewards account. This is a nice offer that is valid on all Southwest routes. The only downside is that you need book your travel during the promotional period and it does not apply for previously booked travel. Member must register for this promotion between October 14, 2013 and November 21, 2013, and registration must be completed prior to commencement of travel. Valid on new reservations booked within the promotional period. Member’s flight must be booked through Southwest Airlines between October 14, 2013 and November 21, 2013. Member’s flight must be completed between October 14, 2013 and November 21, 2013. Rapid Rewards® account number must be entered at the time of booking. Rapid Rewards earned points are calculated using base fare and excise tax. Member will receive 12 bonus points per dollar spent on Business Select® Fares, 10 bonus points on Anytime Fares, and six bonus points on Wanna Get Away® Fares. Bonus points are in addition to the standard flight points earned through Rapid Rewards. Bonus points will not count toward A-List, A-List Preferred, or Companion Pass qualification. Member will receive bonus points within four days after completion of entire ticket. Award, Companion Pass, Southwest Vacations? Packages, Jackpot Deals®, and reward travel do not qualify for this promotion. Changes made to the itinerary after purchase may eliminate qualification for promotion. Southwest Airlines operated flights booked through AirTran® Airways are not eligible for promotion. All Rapid Rewards rules and regulations apply.